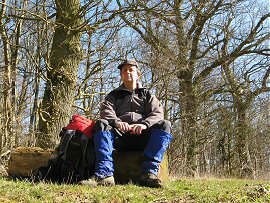 My name is Tim Bertuchi and one of my favourite pastimes is walking / hiking and most of the current content of the site can be found in the Walking section which has photo's and descriptions of the walks I have done. The most recent additions to these pages, and the site, are listed below. The rest of the site can also be explored using the links above. Any text that appears in pale green on this site is a link. If you wish I can be contacted using the email button below. How long since I last did an update??? Anway here is the page for the last stage of the main Chiltern Way walk. I have now started walking the Southern extension which I hope to complete in four circular walks. I have also started walking the South Downs Way and will be back out that way next weekend. Here is the page for a walk I did around theClenchwarton Parish Walk up in Norfolk last weekend. Well here's a rather belated Happy New Year to everyone and also the page for stage 13 of my walk around the Chiltern Way which I did in the last remenants of the snow last weekend. Since my last update I have also walked the Hillingdon Trail and hope to get the pages for that up soon. à±² Bertuchi.co.uk Site views best with Firefox.